Outsourced or In-house Programmatic Buying what's better for you ? Newsroom | #SimplyProgrammatic: Outsourced or In-house Programmatic Buying – What Fits Your Requirement? #SimplyProgrammatic: Outsourced or In-house Programmatic Buying – What Fits Your Requirement? Programmatic in-house has been the talk of the town recently. In an attempt to gain more control over the campaigns, many brands have started considering in-house programmatic advertising as a viable option. However, it is important for every brand to weigh the pros and cons, both functional and monetary, and only then make the choice between choosing to outsource the campaigns to programmatic agencies or having in-house programmatic solutions. 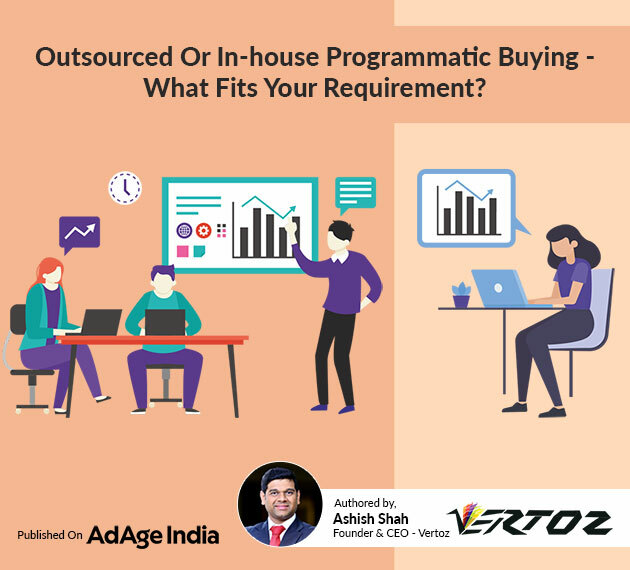 In his regular column called #SimplyProgrammatic published on AdAge India, Vertoz’s Founder & CEO, Ashish Shah, talks in depth about how brands can make the right choice between outsourcing and in-house programmatic. Here are a few excerpts. But, first things first. Let’s understand what exactly does one mean by the term in-house programmatic advertising. It is is nothing but having a campaign management team, in-house. How simple is that! Right? Well, all you need is to hire expertise in data analysis, campaign management, creative management, and many more. There are two kinds of programmatic platforms – self-served and managed. In in-house campaigns, the brands only outsource the ad-serving tech stack, in a way that compliments the brand’s media strategy, in synch with the brands’ internal functions like real-time campaign optimization and ad operations. On the other hand, in managed campaigns, the programmatic agency provides its own expertise and resources to handle all aspects of the campaign. But brands need to remember that there are a number of challenges to taking campaigns in-house. To mention a few, it requires a commitment of time, hiring experts like a data scientists for managing the campaigns, justification to the management of the time and resource requirements, along with providing feasible options for executing it. To know more on the factors to be considered while making the right decision, read the entire coverage here.